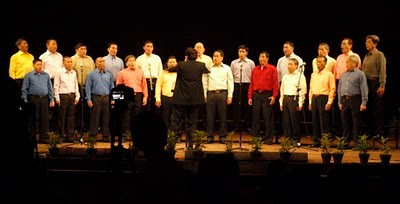 LAST Sunday (Feb. 20, 2011), the entire family watched the reunion concert of the John Van de Steen Male Choir and the Ave Maria Male Choir USA at the Abelardo Hall of the University of the Philippines-Diliman. It seems the reputation of these choirs among music-loving Pinoys is far-reaching that the venue was packed to the rafters. The Ave Maria Male Choir is no stranger to me as they had sung at my sister’s wedding some 30 years ago. As the story goes, they were a bunch of little boys who grew up in the poblacion of Makati, my then future brother-in-law included, and sang as “tiples” (sopranos) during Holy Week and Christmas at the St. Peter and Paul Parish Church. You could say they were Makati’s version of the Vienna Boys Choir, with their angelic voices lauding the Lord’s infinite blessings or beseeching His forgiveness for our sins. As they boys grew up into young men, they became known as the Ave Maria Male Choir, and sometimes joined in the performances of the Manila Cathedral Choir founded by the late Rufino Cardinal Santos and trained under the Belgian priest Fr. John Van de Steen. One particularly memorable achievement for its members was when they collaborated and won the choral group contest of the then-popular noontime show Student Canteen. But life eventually intervened, as it usually does, and the men went their separate ways, many concentrating on their respective careers and growing families. Only a handful actually continued to sing professionally. Fate, though, has a funny way of bringing people back together, and some of these very same men found themselves singing for the Lord again. Many of them now make up the John Van de Steen Male Choir, which has helped revive the Latin Tridentine Mass, first at the St. Jerome Emiliani and Sta. Susanna Parish Church in Alabang, and, lately, at the Church of St. Therese in Newport City at the Villamor Airbase in Pasay City. JVS has since been touring around the country performing for different audiences and, recently, in Macau on the invitation of the Philippine Consulate. Sunday’s concert began with various church hymns by the JVS, their divine voices transporting the audience into a state of grace. Particularly moving was their rendition of Franz Biebl’s “Ave Maria (Angelus Domini),” the best-known work of this German composer which recently regained prominence when it was made part of the repertoire of the Chanticleer, the world-famous male a cappella group. The last part of the program was devoted to popular Filipino love songs like the swoon-worthy “Minsan Lang Kitang Iibigin,” ditties (“Talusaling/Ikaw ang Mahal Ko”), ending in the patriotic “Sa Mahal Kong Bayan” (Lucio San Pedro), a particular favorite of the late Fr. Van de Steen. Despite the now-disparate lives of these men and the many oceans that separate them, it was wonderful to watch how their love for signing continues to bind them. It was certainly one of those rare lovely nights when we could just shut off all our worldly worries and relax, surrounding ourselves in delightful melodies.